Anne Bonifacio, former Woman's Champion 2002 National U.S. Oyster Shucking Women's Oyster Shucking Champion, in 2015 and 2016 once again became the 2018 Woman's U.S. National Oyster Shucking Champion. The 2018 U.S. National Oyster Cook-off Presentation winner was Marty Hyson of Millersville, Maryland. Marty Hyson also won the 2018 People's Choice Award in the U.S. National Oyster Cook-off. Please contact usoysterfestival@gmail.com for details. The 2018 U.S. National Oyster Shucking Champion is Brian Clark of Florida. His shucking time was 1 Minute 52.64 seconds and his final time was 1 minute 58.64 seconds, for a new national record. He was only penalized six seconds. Brian will compete in the Galway, Ireland International Oyster Opening Contest in 2019. Congratulations to our U.S. National Oyster Shucking Champion, Honor Allen, who captured 5th place in the highly competitive Oyster Opening Contest at Galway, Ireland on Sept 29, 2018 Debbie Reynolds of Waldorf, Maryland captured the 2018 U.S. Oyster Cook-off Grand Prize. She is shown here preparing ge Grand Prize winning main dish, “Crispy Fried Oysters Louisiana Poutine Style“. All dishes are prepared in timed competition. Join us for the United States Oyster Festival on the third weekend in October at the St . Mary’s County Fairgrounds. Your support permits the charitable efforts of many St. Mary’s County organizations. The 2017 Defending U.S. National Shucking Grand Champion, Honor Allen of Panama City, Fla. (center), is flanked by the large field of Men’s Oyster shucking contestants who competed in the first rounds of shucking in 2018. There were two father-son teams, one 2018 Cook-off contestant, the husband of another Cook-off contestant and 5 former U.S. National Oyster Shucking Campions. Five of the eight female U.S.National Oyster Festival finalists. May your holidays be blessed and joyous! Big oysters grow from a lover’s spat. Freshly shucked – Always a pleasure! One of many volunteers who cooked for you. Wonderful in 2018, see you next year! Delicious Oysters - Only a few days away! Delicious on the half shell! Oyster harvest in earlier times. Freshly cooked donuts! More than oysters. Cooking up an Oyster Dish! 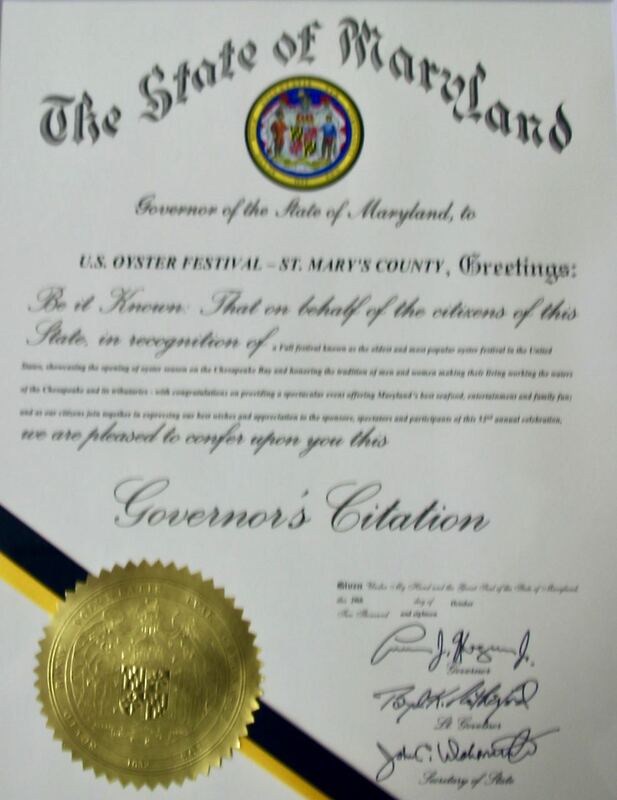 The Oyster Festival sponsor, the Rotary Club of Lexington park was Recently honored by Maryland Governor Larry Hogan for 50 fifty years of community service through the Oyster Festival. Video: Preview: Eatin’ Oysters: Chesapeake Style! The lowly oyster is a delicacy the world over, yet many people say enjoying one is an acquired taste. Here in Maryland though, home of the Chesapeake Bay -- the Chesapeake Oyster is King. Whether it’s slurped raw on the half shell or fried, baked, braised or roasted, it’s a favorite. Eatin’ Oysters: Chesapeake Style!, takes viewers around the Chesapeake region in search of who’s eating oysters, who’s shucking, why they love them, where to find the best of them, and the best ways to eat them.